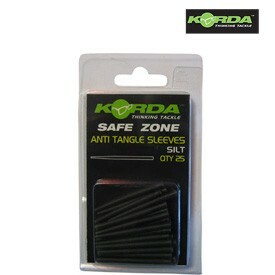 Korda Anti Tangle sleeves have been specially designed to reduce tangles, they also help to push the hooklink away from the lead. When using coated hooklinks such as Hybrid or fluorocarbons like IQ, the rig will work best when the hooklink is laid out straight and away from the lead system. By incorporating these sleeves in your set up you will increase the effectiveness of your rig which will help turn more bites into hooked fish.As with our 'Safe Zone' Leaders we have manufactured these sleeves in four different lakebed colours; Gravel, Weed, Clay & Silt. We have proved on the Underwater films that matching your components to the spot you are fishing will make a huge difference to your catch rates.